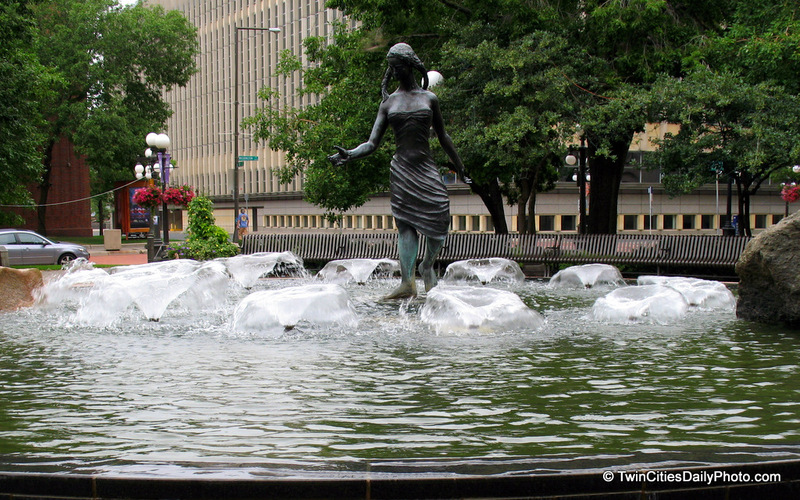 This fountain sits inside the Wells Fargo Building in downtown St Paul. The building when it first opened was the Minnesota World Trade Center and is attached to Town Square. There used to be shops inside the lower floors of the Minnesota Trade Center Building, but now that it has been purchased, all that is there is office space and this fountain in today's photo. There was quite a few people skating at the outdoor ice rink which sits along side the Historic Landmark Center, downtown St Paul. The rink has been there for three or four years now, but I have never taken the time to skate here, only photograph it. Those of you who are local and have been to the Minnesota State Fair are very familiar with the Sky Ride. I was shocked to find out over the winter, all of the Sky Ride cabs are removed and all that is left is....the cab holders, what do you call those things? So, what you're looking at is another ceiling shot. This one comes from the Mall Of America, and it's something they've recently added. Hanging from the ceiling, as you can see, are long strings of crystal squares, triangles and other shapes with LED lighting above. As the crystals move they reflect light and catch your eye. It's a sight to be seen in person to get the full scope of it all. Hopefully this photo does it justice. I actually found this artwork by chance. I was up in a skyway in downtown St Paul, and there it was on the second level of the building I was in. I've seen photos of these red tubes before, but until the day of this photo, I could never find it. From this distance, I cannot tell if the bricks are painted white or if they are two different colors of brick. Either way, I like the contrasting colors between the two. Many different ways to travel all intersect above, below and side by side. My location is the Wabasha Street Bridge looking east. How Y'all Doing!! Yee-haw!! is what this gentleman was yelling at the time of this photo. He was part of the St Paul Winter Carnival parade and I believe he was walking through with the alumni guards or one of the alumni 'Winds' [north, south, east, west], but I'm just not sure. He really excited the crowd and posed great for this photo. The best part of the photo, being as he is dressed like a sheriff, over his left shoulder is the sign that reads 'The Bank Of Saint Paul'. Oh so cold here when there are no clouds at night. The night of this photo was no exception, it was blasted cold! Another crowd favorite of the St Paul Winter Carnival parade was the heat from the hot air balloon flame. It was a temporary warmth, but oh it felt so nice after standing out in the cold temps for hours. Sunset at the St Paul Park Refinery, which I've always know it as the Ashland Oil Refinery, though it has changed names to the Marathon Petroleum Co. and I believe it has been sold again recently. Regardless of the current refinery name, it made for a great backdrop to a wonderful sunset. A crowd favorite of the Winter Carnival Parade is the Saint Paul Bouncing team, where a girl is throw high into the air from a blanket. I must say, it is quite fun to watch. "In the beginning, there were many squads of bouncers and flyers that would travel the parade routes and entertain the crowds every January. In the 1930s, the St. Paul Athletic Club began to sponsor its own team, and in 1937, Lucille Leopold became the first St. Paul Athletic Club "Bouncing Girl." Since then, hundreds of intrepid women have flown with us, wearing the title of Bouncing Girl. When the Athletic Club closed its doors in the early 1990s, the core of that team reinvented itself and became the nonprofit organization it is today, supported by its members and making roughly 12 appearances each year." Very tough to read, but the top of the faded brick building reads 'LOWERY BUILDING'. Personally, I like the contrast between the two buildings. Welcome to February's theme day featuring 'fountains'. Now, I'm sure this doesn't quite look like a fountain, but you see, it's in the dead of winter here in the Twin Cities and outdoor flowing water just doesn't quite work as it does during the summer months. So enjoy my frozen fountain photo, but just to show you what this one looks like in the summer, I've included a shot a took back in 2008 during the summer months.